It was this photo of me that attracted attention on Facebook, and then in the inexplicable way of facebook, my message kept turning up on the general feed (usually my messages appear once on the general feed and then are to be found on time-line while others of some of my FB friends appear repeatedly and others of other FB friends not at all). Whenever my friend Sophie and I get to together, she takes photos. I took one of her in turn. She was startled by how many books I have in my house. I wanted one of my cats to sit on my lap while she took the photo but they were not comfortable enough with her. 30 people "liked" what was said, and there were 17 comments. What is good to record somewhere outside face-book to others people is about Library Thing: it's a good place for cataloguing and managing a sizable private library. It is also good to be able to say several of the people said the room resembled theirs and I got photos from a friend showing some of her rooms resemble mine. Together we bought books as central to our lives -- and the collection goes back further as it includes Ellen's college books and books she took from her parents' house. We've built our lives out of our shared worlds of books. "Our books, dear Book Browser, are a comfort, a presence, a diary of our lives. What more can we say?" (Carol Shields, Swann). 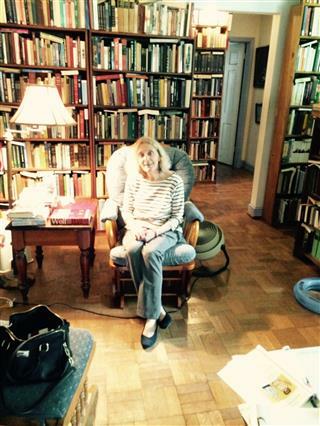 Ellen is a literary historian-scholar, writer, and retired college teacher, and has created for herself a working library. She loves and buys art books too. Ellen has written and published a book about her experiences in cyberspace reading Anthony Trollope with other people: _Trollope on the Net_. (The reader will find many books on Trollope in the catalogue and online essays on cyberspace linked into her homepage.) Her husband Jim, was a mathematician turned computer scientist. He died on October 9, 2013. He opened this account, began the catalogue and loved to collect books. I continue in his honor and to keep him alive by doing what he would have liked. He loved music and I have many music books; the science, math, philosophy and more historical sections of our library were bought by him. We both loved and bought poetry, books of letters, memoirs, biography, and travel books. "La bibliothèque devient une aventure" (Umberto Eco quoted by Chantal Thomas, Souffrir). My life is a continuation of our play without him actually there. I see him in my dreams and experience him continually in my memories. Rien a faire? Desolee. These books are now my memories; this what we read together, talked about together, bought together, catalogued together. It is in a real sense his legacy. He found the bookcase people; he had the courage to buy and live according to our norms and values. The advantage is if your books have ISBNs and are 20th century printings you type in the ISBN in the catalogue card, and voila (from attachment to libraries and bookstores around key places in the world) the card is filled for you. The price was dirt cheap when we joined ($10), then it was $200 and now it may be higher. You have a place to type in where you shelved or put your book too. As I've told a couple of people (off FB) it took Jim and I both of us together several months on and off typing our books in But we used the program to reorganize the book at the same time. We made an art books section, music books, some of my interest. We made an art books section, music books, some of my interest (Bath books, Arthurian books), then French books; books hard to find (like anthologies) in one section, another for reference) so all that took time -- moving rows and rows and rows of books. But when we finished we had a findable library. i did learn that it's sometimes hard to figure out what section to put a book in, and I used as my criteria "how do I or Jim remember this book? Tyler, a good friend commented:: "Well, that's great but where do I find the time to catalog a few thousand books. I do know where all mine are since they're alphabetical on the shelves and in categories. Looks like you have over 10,000 - wow"
To which I said, it did take months and months of the two of us doing it on and off together. Jim made less remarks than I did so I know less about the book or where it is. I often took on those books which required manual entries: no ISBN, rare or unusual prints, my xeroxes of books, very old books. Mike, a long-time friend who I've visted and has visited me wrote: "Books that go in multiple sections can be tough. It's "American history," but also "memoir," and "American Revolution." Hmm. I used to have my shelves labeled, as in the library, to help me keep track of where I put what. Now, it's just a jumble. And I have more than one copy of some works, simply because I couldn't find the one I owned, so I bought another. wink emoticon." Me: I have done the last -- even after organizing. But it's now rare because I can go over to Library Thing and if I have not adequately put where it is in the comments, or can't find it there, Library Thing says I have it. So I don't re-buy. Jim and I did keep up putting books in and I still do. When he died I was near 10,000; now I've gone over. A Trollope friend who has put photos of his beautiful library on the Trollope face-book page wrote: "I also have lots of doubles, but am slowly giving them away. Nothing worse though than buying what you think is a different book and finding that it is a book you already own, eg. Ruth apRoberts :The Moral Trollope". I bought it first and then found a book by Ruth titled "Trollope: Artist and Moralist". I was very happy until I found it was the same book; just different titles. However, I won't give either of them away. The truth is I do have doubles, because once in a while I found Jim and I didn't catalogue a book, or it didn't turn up when I use the search engine. The owner-manager has never bothered to solve the problem of disambiguation so several editions of the same book appear as the identical book. Anyone who knows anything about books knows how wrong and frustrating that attitude can be (especially when buying from Amazon marketplace or other booksellers of used books who are amateurs or who store their books in a warehouse far away from their office and keep no records of edtions). 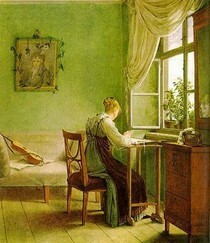 It's German, 1805, very Austen-esque to my eyes. Diana: "Wonderful, iconic picture - and oh, your house is so much neater than mine! How I envy those beautiful parquet floors. I haven't seen a picture from this angle before, either, so it's a new look at your house. But, you are perfectly right: there must be a cat! smile emoticon." Me: "Yes Sophie captured a different angle. She and I are going to the National Museum of Women's Art this coming Wednesday so expect more new pictures. My cats were willing to sit near her and be friendly but not to trust too much smile emoticon"
Anielka: "That is a really beautiful photo. Your girls will always treasure that. I treasure it! Just how I see you in my mind's eye." I fear not but thanked her.